So its my birthday and well its not turning out to be much of a celebration with a whirlwind trip for work. I spend most of week in airports or on a plane. However part of the deal is I have to fly through Perth for work and I have the opportunity to catch-up with my folks for an amazing birthday dinner at Nobu in Crown Resort. 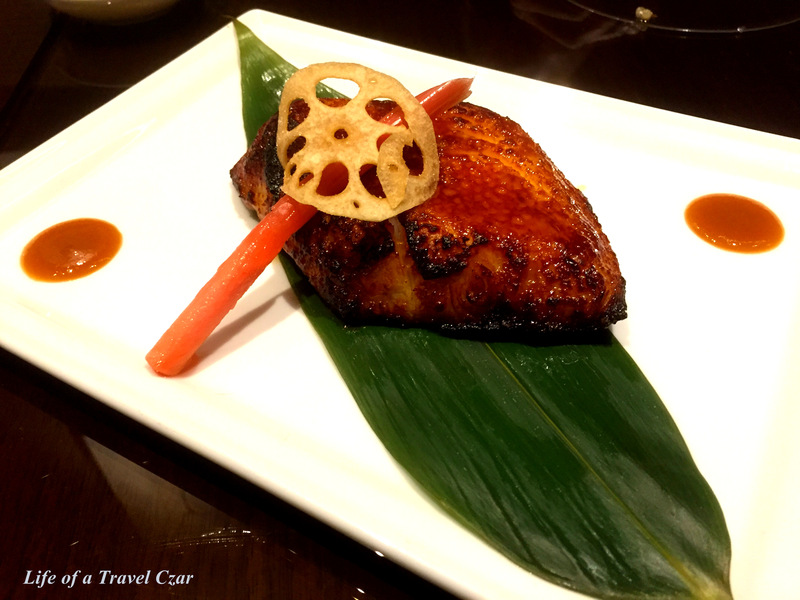 Nobu is an international sensation combining Japanese cuisine with South American influences. I have been to Nobu in Melbourne and loved it, so decided to check out the Perth restaurant to see if its was on par. The layout and decor is beautiful and welcoming. Thankfully we have a booking as the place was full by the time we left. Nobu is structured around share plates where a range of hot, cold and dishes from the grill are selected and shared at the table. Here is how we go through the evening…. This dish is wonderful assortment of contrasting textures and flavours. 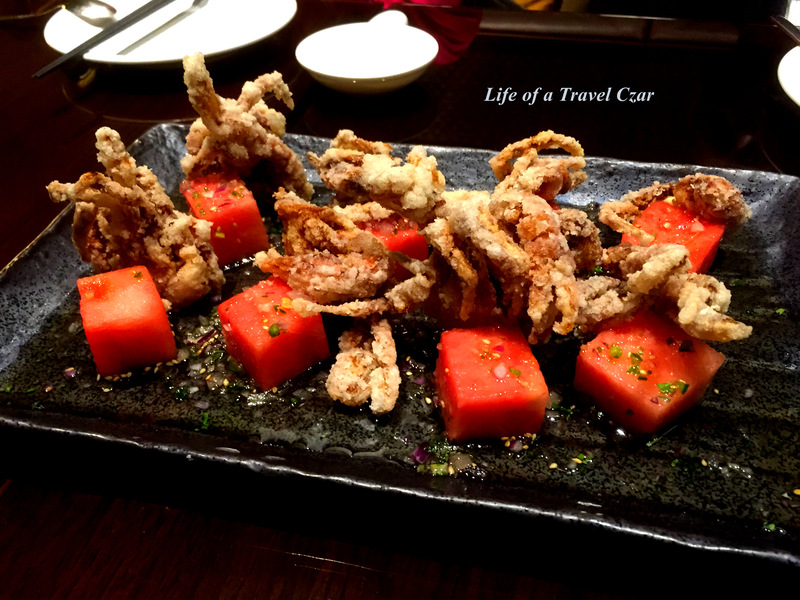 The crispy soft shell crab is a delight on its own. Once the crunchy batter and outer-skin of the crab is pierced through, the flakey soft crab meat proves to be a winner. The sweet vinegar just provides a little dampness, sugar and tang to complement the crab, while the juicy watermelon steps in with its sweetness to provide a refreshing finish to the dish. A wonderful tasting experience. The dish is centred around the fresh soft jelly like tuna which ooze its strong natural flavours to effortlessly charm the palate. The light searing adds some charcoal notes to the tuna, while the tosazu sauce provides some tang and grip to pair with tuna. 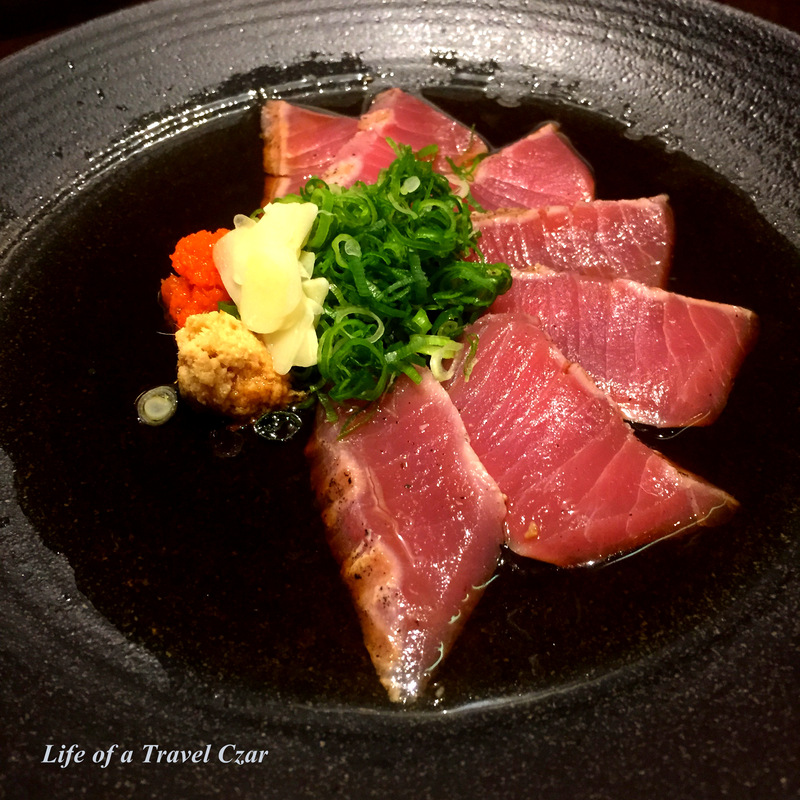 The garlic, ginger and condiments on the side provide uniques bites to each different taste as you add them prior to consumption of the tuna. It’s a simple dish which is executed well with fresh ingredients. This dish was well presented with the succulent yellowtail providing a fresh clean distinct flavour, while the caviar parlayed its minerally “sea-salt” rich flavour through the dish in fine style. This was balanced by a sweet and spicy miso/soy style sauce in the base which introduced itself on the palate with a mild sweet saltiness and finished with a distinct bite of spiceto the balance the flavours in the dish. This was my favourite of the cold dishes. This dish never ceases to amaze me. It’s the sweet / salt of the miso and rich fat of the cod and the flakey fall apart texture of the fish which cornerstone the dish. The natural oils and flavours of the fish is well intact through the cooking process and integrates well with the miso. It is a symphony on the palate with the smoky charred part of the cod which has borne the brunt of the grill’s heat provides a lovely smoky overlay to finish the dish. I am often nervous about lobster and Asian spices as I prefer the lobster to reflect its full flavours or for minimal seasoning which extenuate its natural flavours. However upon first taste this dish does just that, the chunks of lobster meat interact very well with the flavours of the dish to showcase its natural flavours. The sauce and spice inherent in the gravy like accompaniment proves such a treat leaving a light peppery saline aftertaste which lingers on the palate. 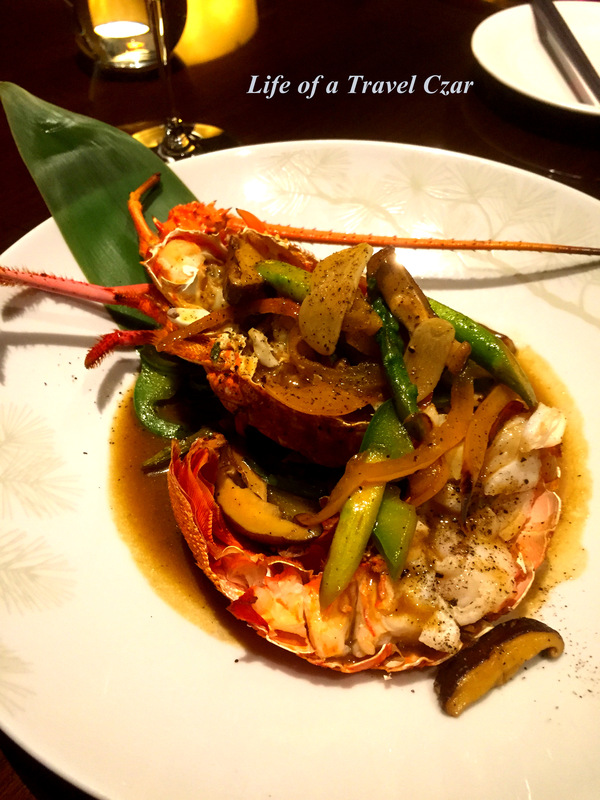 The crunch of the vegetables provides a nice texture contrast to the lobster and adds weight to the dish. The rich buttery transcendent flavour of the wagyu is pitted against the strong pungent earthy flavours of the truffle. It is a dish which delicately balances the flavours of two very powerful ingredients. The wagyu is juicy in the centre and has its charred exterior to provide a beautiful contrast on its own. 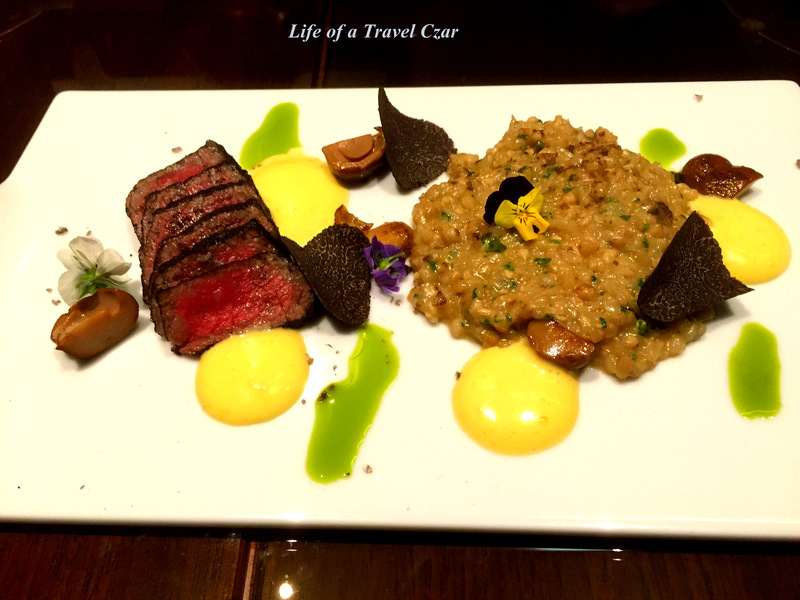 The truffle hollandaise elevates the richness of the dish while the sublime soft creamy buckwheat risotto is a lovely balancer for the dish with the earthy notes of the porcini adding its own flair. The “goldplate” of this dish is the freshly shaved truffles which prove to be a sensuous tasting experience that touches ones soul. The dish is a masterpiece which will etched in my memory for some time. The final dish before we move onto dessert is the sushi rolls. The spicy tuna roll has a lovely creamy spicy mayo which paired well with the tuna and a soft saltiness of the seaweed wrap. 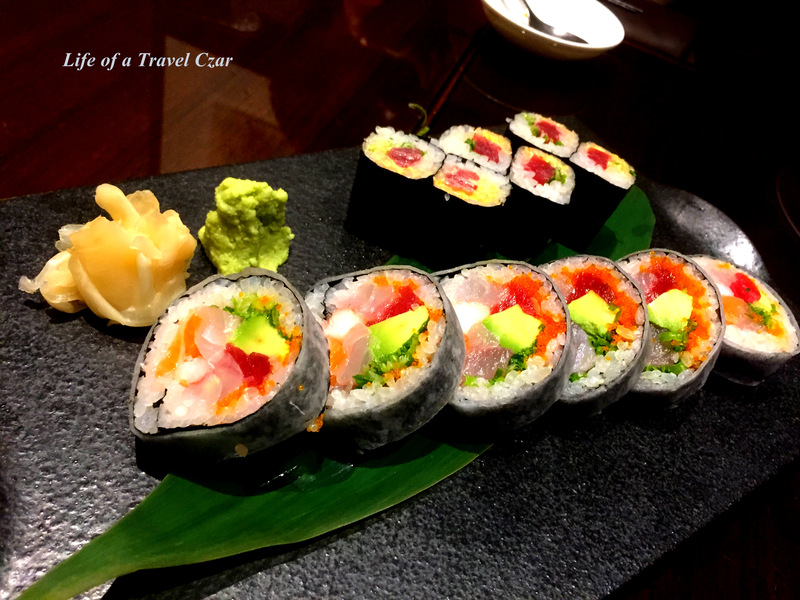 The house roll was a little more complex, the very strong flavours of the three cuts of fish dominated while the mildness of the of the crab stick and avocado adds some balance. The chives add a crunch to the dish and in typical ying/yang style there is streak of saltiness from the roe to wrap it up. 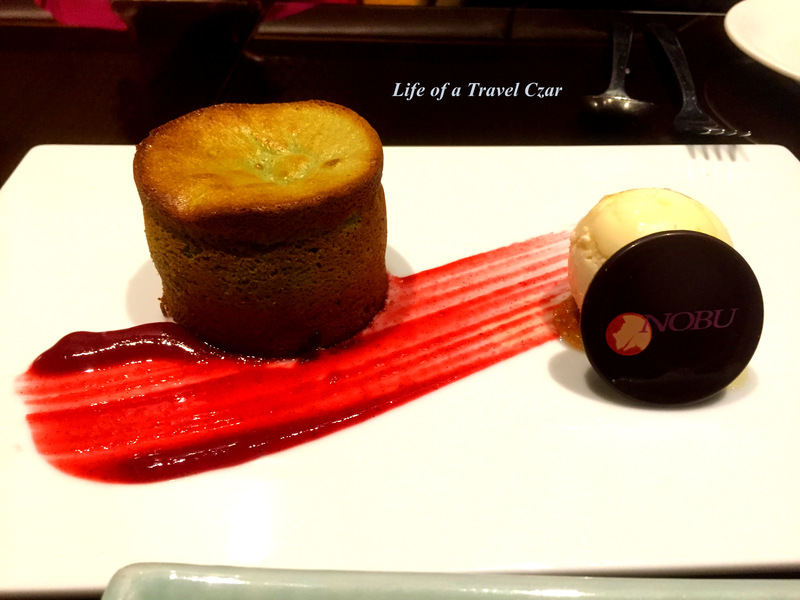 The soft spongy crumb-like texture of the lava cake is broken by yours truly to reveal a translucent thick gooey green tea fondant which pours our onto the plate. The mix of the cake and the fondant is a decadent experience (an almost silky velvety tasting experience if one could put it into words), the sweetness of the white chocolate is balanced by the mild bitterness of the green tea flavour. The Yuzu ice-cream acts swiftly to cut through and temper the richness of the cake to leave one feeling content and dazzled at the same time. The dish is an interesting mix. There is the bitter and salty chocolate soil which forms the base. The soil has a deep flavour and leaves and interesting sensation on the tongue. The bite of the wasabi proves fleeting while the nuttiness of the ganache and rich thick dark chocolate ice-cream parlay an indescribable decadence in the dish. The sweet fluffy marshmallows and the sticky smoky caramel overlay send a rush of sugar through your veins to round out the experience. 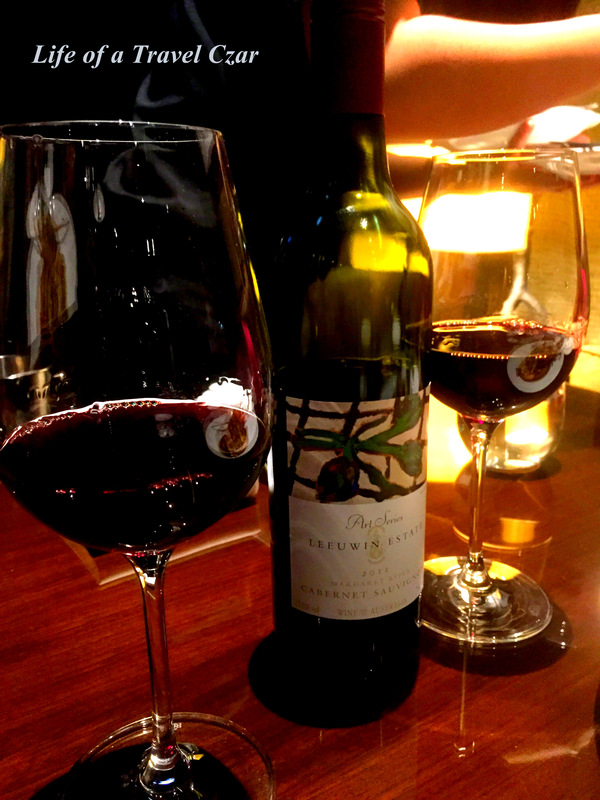 For the wine, we opt for a wonderful bottle of West Australian Cabernet Sauvignon from Margaret River. It’s my birthday and having grown up in WA I grew up with the rich full-bodied reds and it is fitting to celebrate with them. The wine has a beautiful aromas of cherries, cassis, mocha and olives. On the palate the flavours of cherries and currants typical of the cabernet are in full bloom, with the balance of mocha and smokey earthy notes to balance. The fine acidity manages the fruit flavours while some wonderful deep tannins provide the perfect mouthfeel into the finish. Glad we choose this wine to celebrate. So ends a wonderful birthday dinner. So blessed to have such an amazing family to come home to and of course a chance work trip which landed me back in West just a day before my special day. I couldn’t have wished to spend the day any other way! 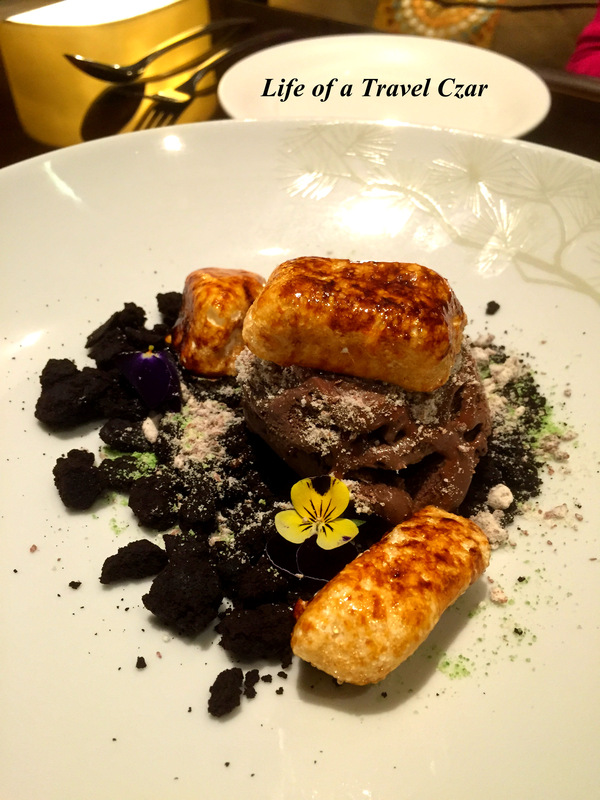 Nobu even provided a special petit fours when we told them it was my birthday… thanks so much! The service and food were stunning. The quality of produce was consistently excellent. Each dish had its own creative flair with though put into contrasting and fusion flavours and textures. The wine list had the variety one would expect and I honestly couldn’t fault the service even on a very busy night. 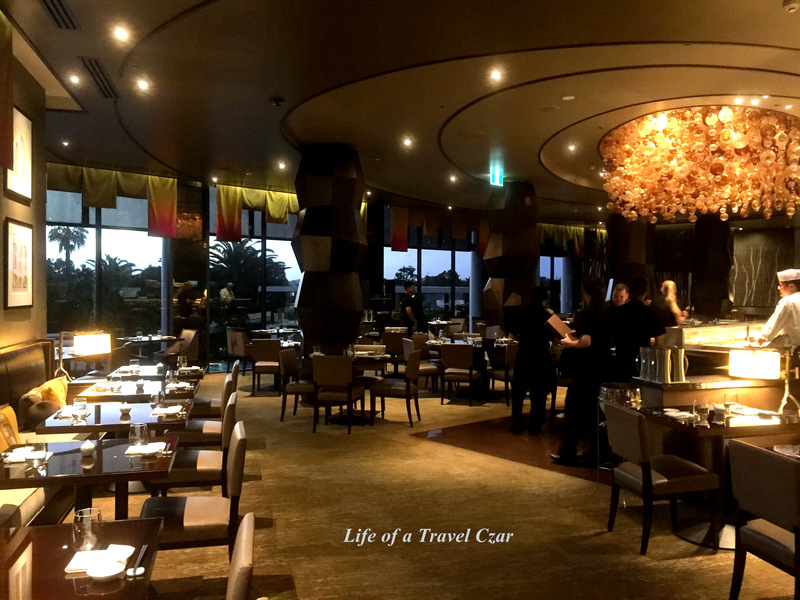 I know Nobu may be considered an outlet but excellence is excellence and I will give Nobu Perth 10/10 – the only other two restaurants I have given that score is Eleven Madison Park and Le Louis XV. Wow looks amazing – on my list for the next time I make it to WA!